Baseline airfares aren’t increasing, because airlines are turning to ancillary fees for baggage and seat elections to increase profits while still luring flyers with cheap tickets on online booking sites. The bad news for air travelers is that domestic fares have increased about 4.5 percent in 2012, bringing the average airline ticket to about $375. The good news is that the increase has been modest compared with 2011, when fares jumped 8.3 percent. Even better news, industry analysts predict air fares will rise even less in 2013. But before you pop the cork on the champagne, know that industry experts warn fares could still soar in the last two months of this year. Southwest drives the most airfare hikes that stick in the US. Photo by Douglas Muth. 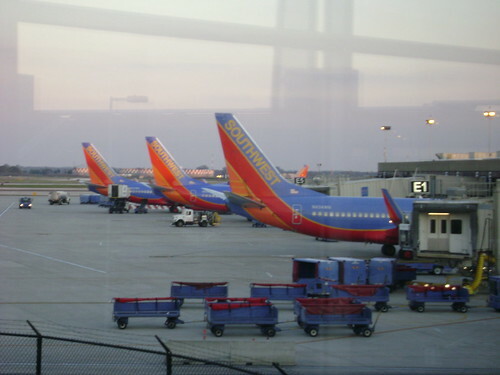 In fact, Southwest Airlines, the nation’s largest carrier of domestic passengers, raised domestic prices last week $4 to $10 per round trip, depending on the route. It was a hike matched by all the major U.S.-based carriers. The increase was the 14th price boost in 2012, half of which were matched by all the major airlines and half of which were rescinded after few, if any, airlines went along with the hike. “At the moment, it’s impossible to say if 2012 will see more airfare hikes but don’t bet against it, not if history is any guide,” said Anne McDermott, editor at airfare news website FareCompare. The average domestic fare for September was $375.35, according to the Airline Reporting Corp., the Arlington, Va., company that manages payments for tickets between travel agents and airlines. A forecast released last week by American Express Global Business Travel predicted airfares in North American would rise 1 percent to 4 percent in 2013, depending on the airline seat and the length of the flight. An earlier forecast by business travel management company Carlson Wagonlit Travel came up with a similar conclusion, a rise of 2.8 percent for the year. “While the economies of the United States and Canada are experiencing slow and steady improvement, there is no major growth expected in the foreseeable future, which will help contain travel price increases in 2013 for most categories,” the Carlson forecast said.